LSU pitcher Eric Walker and third baseman Josh Smith were two of the best freshmen in the country two years ago. Both Walker and Smith earned Freshman All-America honors in 2017. However, both players then were dealt some bad fortune. Walker left his start in the College World Series due to pain in his elbow. The diagnosis revealed a tear in the right elbow, which necessitated Tommy John surgery. Walker sat out the entire 2018 season. Smith felt some discomfort in his back following the opening weekend of the 2018 campaign. After weeks of rehab, Smith attempted a comeback which lasted all of three games. So, Smith’s 2018 season was six games long. The Tigers’ 2019 season-opener against Louisiana-Monroe is now two weeks away. Both Walker and Smith can see the end of their rehabilitation trail. Walker is projected to start on the mound against Air Force in the third game of the year. Smith has been penciled in as LSU’s starting shortstop. Walker cannot hide his enthusiasm for returning to the Tigers pitching rotation. “It’s good to be back,” Walker said. “My arm feels great. I am just excited to be back out here. I just missed the simple things. The surgery was 17 or 18 months ago. I don’t even picture it as me being in rehab now. Although Smith’s injury happened eight months after Walker’s, he did not have an easy 2018. 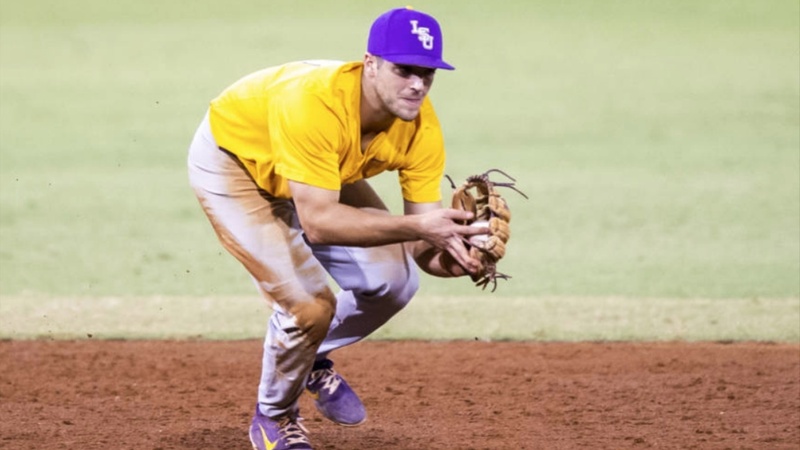 Smith had a solid freshman campaign when he was LSU’s starting third baseman on a team which ended the year as the national runner-up to Florida. Smith batted .281 with five homers and 48 runs batted in. Smith, who drew 39 walks, had 16 doubles and scored 52 runs. Smith is now moving back to the position in which he played at Baton Rouge Catholic High School. Smith was an All-State shortstop in high school. In his senior season, Smith batted .379 with six homers and 28 RBIs. Smith, who stole 32 bases, committed only three errors that year. When Walker returned to the mound in the fall, it seemed like nothing had changed for him. Walker, who had an 8-2 record with a 3.48 earned run average as a freshman, never relied on his fast ball. Walker, who was the No. 3 starter behind Alex Lange and Jared Poche, is a location pitcher. LSU head coach Paul Mainieri and pitching coach Alan Dunn have no intention of rushing back Walker. Mainieri has indicated that Walker will be at a lower pitch count earlier in the season.